Georgy Konstantinovich Zhukov (1 December [O.S. 19 November] 1896 � 18 June 1974) was a Soviet Red Army officer who became Chief of General Staff, Deputy Commander-in-Chief, Minister of Defence and a member of the Politburo. During World War II he participated in multiple battles, ultimately commanding the 1st Belorussian Front in the Battle of Berlin, which resulted in the defeat of Nazi Germany, and the end of the War in Europe. Zhukov ultimately held the rank of Marshal of Soviet Union. [Further reading]. This 30 cm bust dates from the 1960s or 1970s and is made from metal. The detailwork is fantastic and the awards are fully recognizable. Although not signed, the bust meet the standard of top contemporary artists of the Soviet Union. 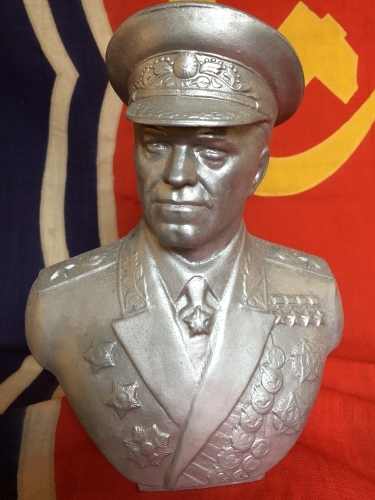 The bust depicts MSU Zhukov wearing his M1954 Marshal of the Soviet Union parade uniform and among the awards can be seen the titles of Hero of Soviet Union as well as Zhukovs double awarded Order of Victory and Marshal star.